Yoga is described/translated as a union of the body and mind…I like to think of it as them working together harmoniously. Through the practice of Yoga (physical movement into postures working with your breath and meditation) one can learn to still the thought processes of the mind, and start to discover moments of stillness within. Improving the quality, flexibility and range of movement of your body. Encouraging you to become more aware of daily patterns of movement. Time for yourself to be quiet and reflective away from busy lifestyles. Learning techniques to connect to and aid breathing, to encourage quietening of the mind. Relaxation practice to aid the reduction of tension and effects of stress in the musculature of the body. The studio for up to 4 people a session. Each session follows a structure of breathing, movement with the breath, seated breathing practices and relaxation. 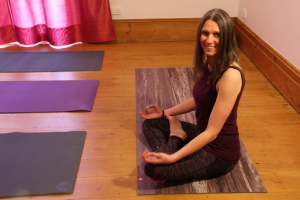 Over the years I have been practicing Yoga I have studied different styles including, Iyengar, Ashtanga, Scaravelli and Viniyoga style of yoga. I have studied Pranayama breathing principles and Yogic Philosophy. Click on the Yoga Classes section for full details of when and where I teach Yoga. 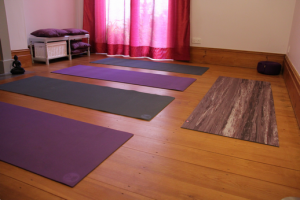 I have a cosy Yoga Studio at home for small groups of up to 4 and one to one sessions…please contact me if you would like to register an interest in classes at the studio. I am available to teach Yoga at work places. It is advisable not to eat at least two hours prior to practicing. Wear comfortable clothing that enables movement. It is preferable to practice the physical postures bare foot. Please see the prices page for cost details and get in touch via the contact page to book.